Wednesday was a lazy day for me. I ate breakfast around 10:30 and then worked on the blog post for Tuesday. At 2:00 PM I decided to get some Skyline Chili for lunch and there’s a restaurant within a mile of my host’s place. I’m staying with a friend of Victoria’s (Mary Kate). The two of them were in the same hotdogger class (22). “Hotdoggers” are those who drive around in the wienermobile for a year after college. They weren’t partners but they are pretty close friends. Thanks MK for letting me crash for a few nights! I left for the game just before 5:00 PM and was parked at Paul Brown Stadium by 5:15. 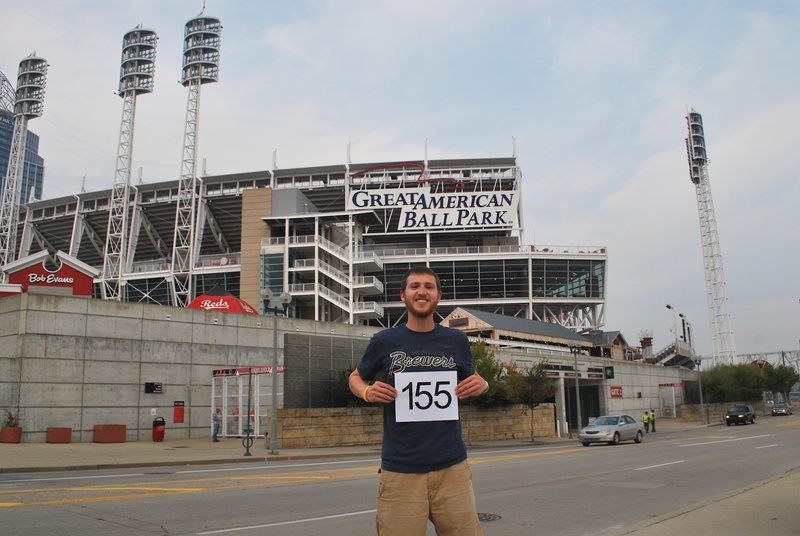 I met Barry and we walked over to the ballpark where Barry took game photo number 155. I had already gotten one taken from outside the stadium (game #73 on 6/25) but that was from outside the home plate entrance. This was taken from outside of the right field corner and from across E Mehring Way. After getting the picture taken we walked up Joe Nuxhall Way to the Holy Grail Tavern & Grille. 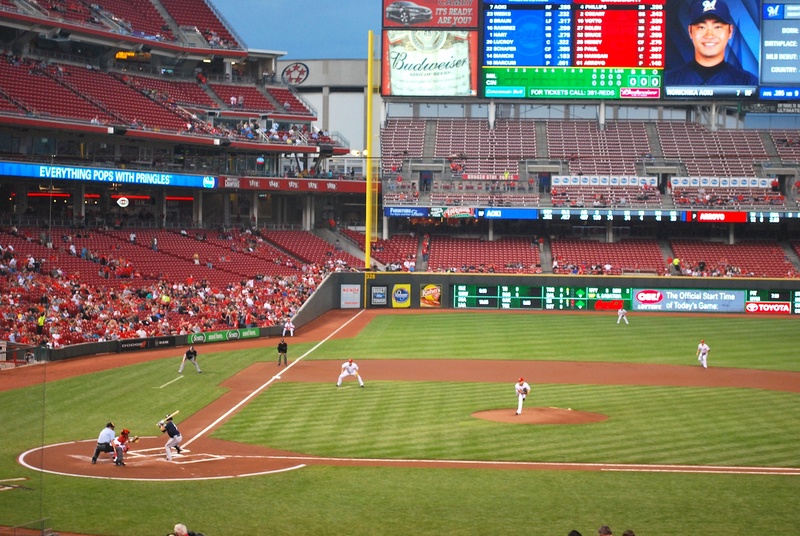 It’s across the street from Great American Ballpark and it gets very crowded before home games. We had two beers and met up with a friend of Barry’s (Will). I met Will before and he’s a (somewhat) serious Reds fan. Barry gives him a hard time because he doesn’t always get there in time for first pitch but overall Will is a nice guy who supports his team. At 6:40 we walked across the street and into the stadium. In the right field corner of the field level they have a restaurant called Mr. Red’s Smokehouse. I mentioned it in the post on July 21st and it’s similar to the Chef’s Table at Miller Park in that they have food that is popular in the visiting team’s city. 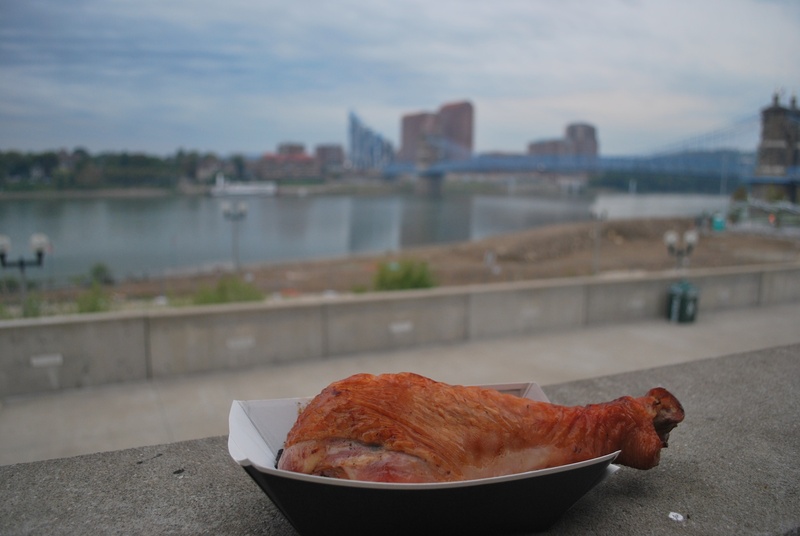 They had a beer brat when the Brewers were in town but I opted for a turkey leg, and boy was it massive. I’m not sure if you can tell but it’s almost as long as the bridge!!! I wish I could’ve seen the whole turkey. We got to our seats in section 128 with a few minutes to spare before Bronson Arroyo delivered a ball to Aoki. 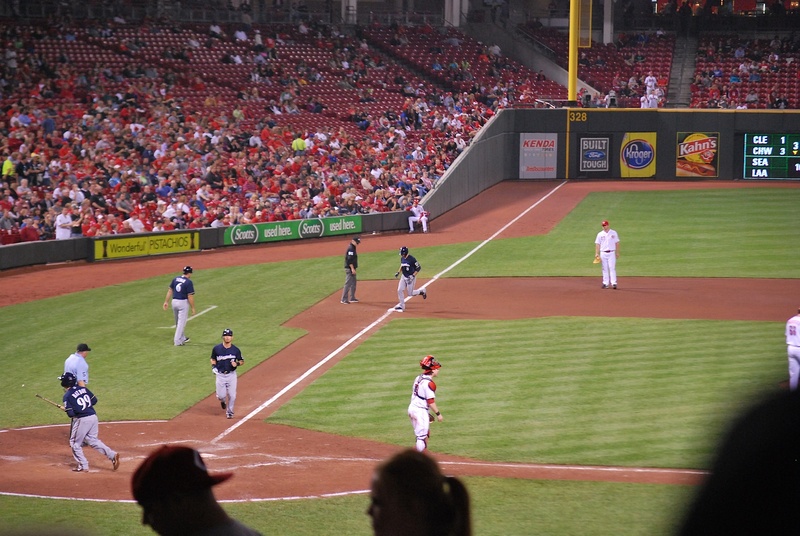 The Reds scored a solo run in the bottom of the 1st but Marcum pitched better after that frame. In the 3rd Aoki homered with two outs and it was a laser that appeared to not get higher than 30 feet in the air (we’ll see what the apex is listed at when hittrackeronline updates their database). I looked this morning and they say it reached 56 feet at it’s apex, hmmmmmm. I took the picture just before Aoki did the finger mustache gesture, but you can see third base coach Ed Sedar doing it. Weeks followed Aoki with a single and Braun doubled to put runners on 2nd and 3rd. Ramirez stepped in looking to give himself 100 RBI on the season. 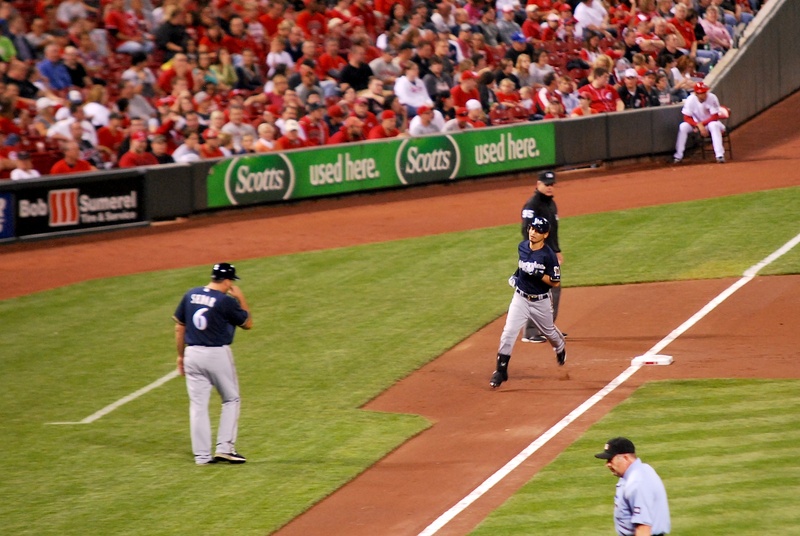 On the 0-1 pitch Ramirez lined one up the middle that shortstop Zack Cozart couldn’t coral, giving Ram-Ram his seventh 100 RBI season and first since 2008. I’ll be the first to admit that I was skeptical about the signing but he has performed better than even I was hoping for. I’m not afraid to say I was very, very wrong. Nice work, Aramis, my apologies. Hart added an RBI single and the Brewers had a 3-1 lead in the 3rd. In the 6th Jeff Bianchi added some insurance with a sacrifice fly and then Braun sent some people home early with a 2-run home run in the 7th. Aoki, who had himself a day, doubled home Bianchi in the 8th and Lucroy wrapped up the scoring with a solo shot in the 9th. Brewers win! Brewers win! Final score: Brewers 8 – Reds 1. With the Cardinals losing the Brewers pulled to within 3.5 games, and it’s now going to take the Brewers going 7-0 over their last 7 and the Cards going 3-3. Never say never. 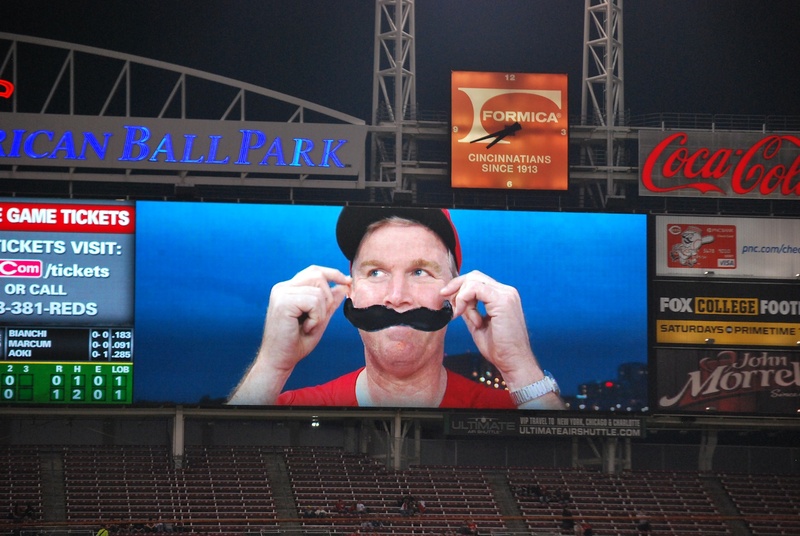 1) A mustache that was fixed on the screen and then the camera guy(s) would pan the stands and put it on people. This individual was curling his imaginary mustache. 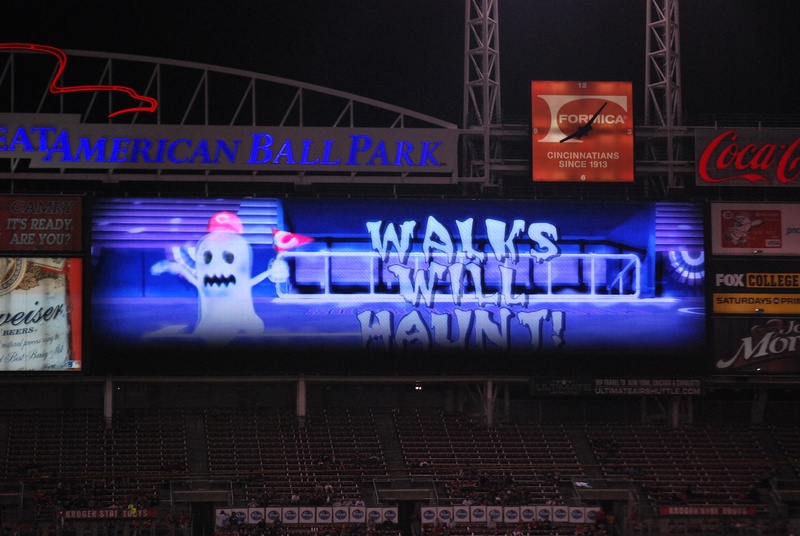 2) “Walks will haunt!” The Reds put this on the scoreboard after a visiting team walks one of the Reds batters. It’s true, but after doing some brief research I’ve noticed there are some conflicting numbers. 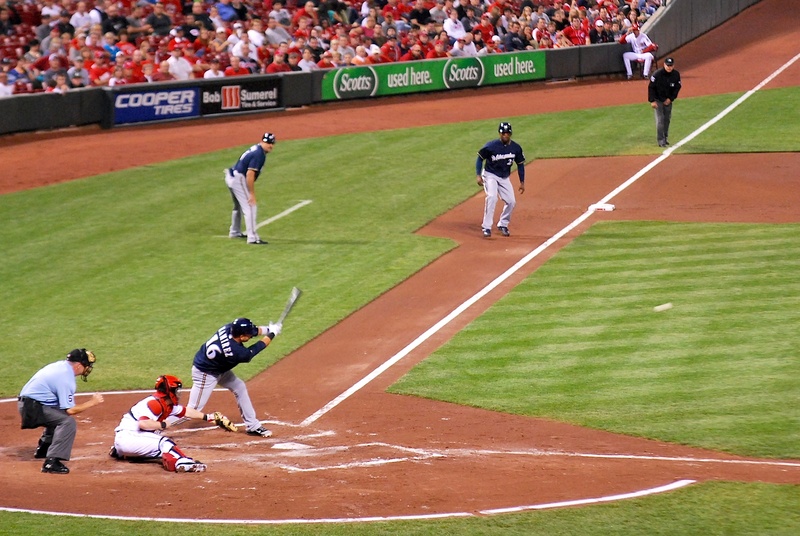 One website says a leadoff walk scores 38% of the time while another says 80% of the time. Interesting…… I had thought it was in the 70% range but I’ll keep digging. Either way, walks are bad so the scoreboard message is accurate (just ask the Brewers’ bullpen about the first 4.5 months of the season). It’s 10:40 on Thursday morning and I’ll be leaving shortly for the finale of the three game set. Barring a miraculous finish and the Brewers making the playoffs today will be my last away game of the season. Wow, time flies when you’re having fun. There’s a 40-60% chance of rain from 1:00 PM to 6:00 PM so I’m hoping the game gets played. A 161 game season would mean that I’d just have to try it again next year. Not trying to be a buzz kill, but I hope you only get to see 161 games this year, so next year, you’ll have to see 162 😀 I look forward to reading your blog everyday and the adventures/stories you had…even if you get to see 162 games this year, you would have done what one baseball fan can only dream of….you made millions of dreams come true, not only from baseball, but for the charity too.